The Soul That Sinneth Shall...? The lid is off the shocking story of WHO and WHAT the mysterious "Antichrist" really is. You need to open your mind to understand this vital TRUTH — here made plain for the first time. WHY can't you worship God just as you please? Or can you? Does it make any difference? The existence of over four hundred religious denominations and sects in the United States alone SEEMS to testify that men can worship God in many different ways and still have His blessing. What about this? Can you worship God just any way? Where did this idea come from? What does God say about it? The common attitude of most people in our society is that each man is free to choose the religion that suits him the best and that it doesn't make too much difference anyway. "Go to the church of your choice," the wayside signs read. In other words, you are left free by God to worship Him as it pleases you. 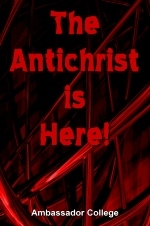 This is a doctrine of antichrist! Many people are so determined to have this kind of religious "freedom" that they even refuse to carry on an objective discussion of their religious beliefs. They seem actually AFRAID to submit their beliefs to any scrutiny lest they be found in error on some point. A dear friend and I were once discussing some new spiritual truth that I had found but when I turned to ask about some of her religious beliefs, she replied almost fearfully, "Oh, I don't even talk about my faith in God. My beliefs are too sacred to me to discuss." Her beliefs were too "sacred" to HER to discuss! If this poor, mixed up woman had known much of God's TRUTH, she would have realized that God commands us to give an answer to those who ask us the reason of the hope that is in us (I Pet. 3:15). She should also have known that nothing can really be "sacred" unless God has made it sacred. And God has made NOTHING too sacred to even talk about! But what about you? Haven't you evolved your ideas of what is "sacred?" Are you afraid to talk about them — to examine them? God says: "Prove all things; hold fast that which is good" (I Thes. 5:21). You had better realize that it makes very little difference whether or not your religious ideas please you. The real question is whether or not they please GOD. God is GOD! He tells you how to worship Him. Although He permits it during this age, you are NOT really free to worship God as it pleases you — but as it pleases Him. Jesus Christ warned: "In VAIN do they worship me, teaching for doctrines the commandments of men. For laying aside the commandment of God, ye hold the tradition of men" (Mark 7:7-8). Yes, you can worship God and Christ in VAIN. How? By following the TRADITIONS of men — the doctrines of antichrist! It's just that simple. Men are pretty easily mixed up. Groups and churches and denominations of men also get mixed up. They get in a rut. They get away from the Bible in the political atmosphere of church councils and church board meetings. They get to following the traditions of men. In fact, if the plain statements of Jesus Christ and the apostles mean at all what they say — then we should expect to find that most of the large churches and denominations of men would be in gross error. We should expect that only a scattered few would have retained the teachings of Jesus Christ. Jesus clearly stated: "Enter ye in at the strait gate: for wide is the gate, and broad is the way, that leadeth to destruction, and MANY there be which go in thereat [following antichrist]: Because strait is the gate, and narrow is the way, which leadeth unto life, and FEW there be that find it" (Mat. 7:13-14). Did Jesus mean what He said? He must have, because He said the same thing in many different ways. Yet very few professing Christians realize that Jesus' true followers were to be small in number, scattered, persecuted, despised by the world. This truth has been buried by the professing Christian world. Most of the preachers and psychologists in this modern world try to tell us "how to win friends and influence people." They tell us how to be well-liked and "accepted" by this world. But Jesus said the exact OPPOSITE! He said: "Blessed are ye, when men shall HATE you, and when they shall separate you from their company, and shall reproach you, and cast out your name for evil, for the Son of man's sake" (Luke 6:22). Then Jesus warned: "WOE unto you when all men shall speak well of you! for so did their fathers to the false prophets" (verse 26). It doesn't sound like Jesus' true followers would be popular with the business and social sets of this world's society, does it? Later, Jesus called His disciples the "little flock" (Luke 12:32), and told them, "If the world HATE you, you know that it hated me before it hated you... If they have persecuted me, they WILL also PERSECUTE You" (John 15: 18-20). And Christ's chief apostles, Peter and Paul, were both inspired by God to foretell the same things concerning Jesus' true followers. The inspired Paul warned in his last letter to Timothy: "The time will come when they will not endure sound doctrine; but after their own lusts shall they heap to themselves teachers, having itching ears; and they shall turn away their ears from the truth, and shall be turned unto fables" (II Tim. 4:3-4). In his last letter before his martyrdom, the apostle Peter warned future Christians: "But there were false prophets among the people (of Israel), even as there shall be false teachers among you, who privily shall bring in damnable heresies, even denying the Lord that bought them, and bring upon themselves swift destruction. And many shall follow their pernicious ways; by reason of whom the way of truth shall be evil spoken of" (II Pet. 2:1-2). All of these plain, clear scriptures ought to make us realize that God knew and prophesied that the truth revealed through Jesus Christ His Son would be undermined and subverted by false teachers — teaching the doctrines of antichrist — misleading many who had started out to be followers of Jesus Christ. The situation was so bad when Jude wrote his epistle that he had to exhort the Christians to "earnestly contend for the faith which was once delivered unto the saints." In other words, they had to strive or fight to get back to the faith which Christ brought but which had already become perverted at this early date. The mixed-up, confused situation of the so-called "Christendom" of today — and of the early church soon after the time of the apostles — can only be understood by realizing that God Himself foreknew and permitted false teachers to creep into and subvert many congregations in the early church and develop through human reason a professing "Christianity" which actually rejected the message Jesus Christ brought. In explaining that Jesus was not to return to this earth for some time, the apostle Paul wrote the Thessalonian Christians: "Let no man deceive you by any means: for that day shall not come, except there come a falling away first, and that man of sin be revealed, the son of perdition" (II Thes. 2:3). He said: "For the mystery of iniquity (the original Greek means LAWLESSNESS) doth already work" (verse 7). Thus we know that even in Paul's day the failing away from the truth had already begun, and disobedience to God's law (or LAWLESSNESS) in a professing "Christianity" was becoming popular. The doctrines of antichrist were developing! The truth as we can well see from all these prophecies is that God is permitting mankind to go his own way during this age, rejecting Christ's true message, persecuting those who remain faithful to the truth, and substituting in its stead a religion labeled "Christianity" but actually based on the "traditions of men" which Jesus condemned. This brings us up to the present time when men in this chaotic, confused, war-torn world are seeking to find the way out of their troubles and many are seeking at last to find the true God. As we look about over the hundreds of diverse, disagreeing, and conflicting denominations and religious sects, it seems difficult indeed for one to determine whether each or any of these is actually preaching and teaching Christ's message and being used of God as His church. We know Jesus promised: "I will build my church" (Mat. 16:18). We know that the Holy Spirit was given to His church on the day of Pentecost (Acts 2). We know that the Holy Spirit is given upon the conditions of repentance and baptism (Acts 2:38). It is given to those that OBEY God (Acts 5:32). Jesus told His disciples: "Howbeit. when He, the Spirit of truth, is come, He will guide you into all truth" (John 16:13). Every Christian must have been begotten by God's Spirit (Rom. 8:14), and that Spirit is actually God's character implanted within us — His power for self-mastery, His love to enable us to obey Him and serve others, and His mind, a sound mind to give us proper wisdom to look at everything from God's point of view (II Tim. 1:7). But how can we know and test whether any idea, doctrine, or Bible interpretation is really of God's Spirit or of some evil spirit? Does God Himself reveal such a test? This amazing, heretofore misunderstood test is found in I John 4:1-6. God inspired John to instruct us: "Beloved, believe not every spirit, but try the spirits whether they are of God: because many false prophets are gone out into the world." John here tells us to test any ideas or supposed revelations, and you will notice that they primarily come through false prophets or preachers. Remember that this text is not to show us how to determine whether a person is demon-possessed — but how to know whether a preacher or prophet is being guided by God's Spirit or by the spirit of Antichrist, the spirit and influence of Satan himself. A wicked spirit will often verbally confess belief in Jesus Christ. After all, demons are lying spirits, as Satan himself is called "the father of lies" (John 8:44). John continues: "Hereby know ye the Spirit of God: Every spirit that confesseth that Jesus Christ is come in the flesh is of God: and every spirit that confesseth not that Jesus Christ is come in the flesh is not of God: and THIS is that spirit of ANTICHRIST, whereof ye have heard that it should come; and even now already is it in the world. This text describes what the antichrist really is. Many mistakenly assume that antichrist is just another name for the prophesied "beast" or "false prophet," who are already in Europe and soon to manifest themselves! This assumption is NOT true! In the book of Revelation there is not a single direct reference to the antichrist as a single "superman." Notice! John did not write that an antichrist WOULD come hundreds of years later. He wrote that this wicked, devilish spirit is "even NOW " — about 90 A.D. when John wrote — "in the world." This same thing is brought out in II John 7, "For many deceivers are gone forth into the world: they that confess not Jesus Christ coming in the flesh. This is the deceiver and the antichrist." John said MANY deceivers, or antichrists — not just one great false prophet, but MANY antichrists — ARE already gone forth into the world. And this was before the end of the first century! The real answer to the question of who is an antichrist is found in a proper understanding of the original Greek text in which John wrote. The proper translation of I John 4:2 ought to read: "Every spirit that confesseth that Jesus Christ is coming in the flesh is of God." As is explained in the Critical and Experimental Commentary by Jamieson, Fausset, and Brown, this passage is in the equivalent of our present progressive tense, denoting continued action now. In other words, Jesus Christ is coming in the flesh right now by living His life in His people, His church. Actually, the whole context of this passage explains this very truth when read carefully. Just a few verses back in I John 3:22 we read: "And whatsoever we ask, we receive of Him, BECAUSE we keep His commandments, and do those things that are pleasing in His sight." Then verse 24 explains: "And he that keepeth His commandments dwelleth in Him (Christ), and He (dwells) in him. And hereby we know that He abideth in us, by the Spirit which He hath given us." Notice! Christ abides or lives in us through His Spirit. The doctrine of antichrists, then, is that Christ does not literally dwell within and live His life within His people today. It is the teaching and the false idea that "Christians" today can live a different kind of life from what Jesus lived and still be His true followers. It often includes the idea that Christ was righteous in our stead, therefore we don't have to be. We just accept Him and His righteousness is imputed to us — thus God "kids Himself" and pretends that we are really righteous when we actually are NOT! This doctrine is a damnable LIE! Jesus Christ is the same yesterday, today, and forever (Heb. 13:8). He will live the same kind of life in you and me today that He did live 1900 years ago when He trod this earth in the human flesh. At that time, He continually taught obedience to all of God's commandments (Mat. 5:19). When a young man asked Him how to inherit eternal life, Jesus replied: "Keep the commandments" (Mar. 19:17). Near the end of his physical life, He instructed His disciples: "If you keep my commandments you shall abide in my love; even as I have kept my Father's commandments, and abide in His love" (John 15:10). There are many, many false ministers abroad today teaching this doctrine of Antichrist, this doctrine of disobedience to God's commandments, a doctrine of "no works." The apostle Paul spoke false ministers in II Corinthians 11:13-15. He said: "For such are FALSE APOSTLES, deceitful workers, transforming themselves into the apostles of Christ. And no marvel; for Satan himself is transformed into an angel of light. Therefore it is no great thing if his (Satan's) ministers also be transformed as the ministers of righteousness; whose end shall be according to their works." You will notice here that Satan has ministers. They appear to be righteous ministers. But their end — their final reward — shall be according to their works — the very thing they seek to deny. God intends His people to obey His commandments, to do good works, and to live by every word of God. Once you get this principle straight and clearly understand the spirit of Antichrist and how to test whether any idea or doctrine is of God, then by a diligent study of God's word and by constant prayer you may come to a deeper understanding of the real purpose of your life and experience a closer contact with the living God than you may have heretofore dreamed possible. God has always had His church, His work, which has faithfully proclaimed the true message He sent through Jesus Christ. In this end time, that message of obedience to God's kingdom and rule is to be preached by His church as a witness to all nations (Mat. 24:14). You are reading this very message this instant! In Revelation 12:17 the true church of God is described as a woman persecuted by the devil. This church is a remnant "which keep the commandments of God, and have the testimony of Jesus Christ." The true saints of God are described in like manner in Revelation 14:12: "Here is the patience of the saints: here are they that keep the commandments of God, and the faith of Jesus." Yes, Jesus Christ is to live and dwell within His people today through His Spirit. Their lives will be lives of full and complete obedience just as Jesus' life was in the flesh and is now being lived through them. Their customs, their traditions, their way of life will be the same in every way as His was, because He does not change. The true Christian can say with the apostle Paul: "I am crucified with Christ: nevertheless I live; yet not I but CHRIST LIVETH IN ME: and the life which I now live in the flesh, I live by the faith of the Son of God, who loved me, and gave Himself for me" (Gal. 2:20). Examine yourself honestly. Have you really understood Christianity before? Is Christ really living His life in you? Do you have the spiritual "backbone" to act on the knowledge you have just received?